HONOLULU » The U.S. Air Force plans to send its most advanced fighter jet, the F-22, abroad for the first time when it deploys 12 of the planes to Okinawa next month. Gen. Paul Hester, Pacific Air Forces commander, said the planes will train with Japan's air force, U.S. F-15s and the U.S. Navy while at Okinawa's Kadena Air Base. The U.S. military presence in the region will get a boost with the deployment, helping its ability to respond to any security crises that might erupt. The planes will give the top commander of U.S. forces in the Pacific "all the options to face the contingencies that he might face," Hester told the Associated Press in an interview. The planes, based at Langley Air Force Base in Virginia, are expected to stay in Okinawa for a few months. More than 250 personnel will accompany them. The F-22s became operational -- or available for combat missions -- in December 2005 after being in development for decades. The Air Force sent 12 of the planes to Alaska for training in June but hasn't deployed them outside the United States before. Bruce Bechtol, a professor at the Marine Corps Command and Staff College, said the planes' presence on Okinawa will likely grab the attention of North Korea, which is less than 1,000 miles from the island. "It's very important to understand that when we do these things, they serve really a dual mission. A, it trains our pilots, which is great," Bechtol said. "It also sends a message to the North Koreans: We have this capability. And so it serves as a deterrent effect." At $360 million per plane, including research and development, the F-22 is among the world's most expensive jets. Armed with stealth features, the F-22s are designed to sneak past enemy radar, a quality seen in the F-117 Nighthawk but not in jets like the F-15 or F-16. The F-22 can also cruise at the supersonic speed of 1,000 miles per hour. F-16 fighter jets can fly faster than the speed of sound but only for short periods. 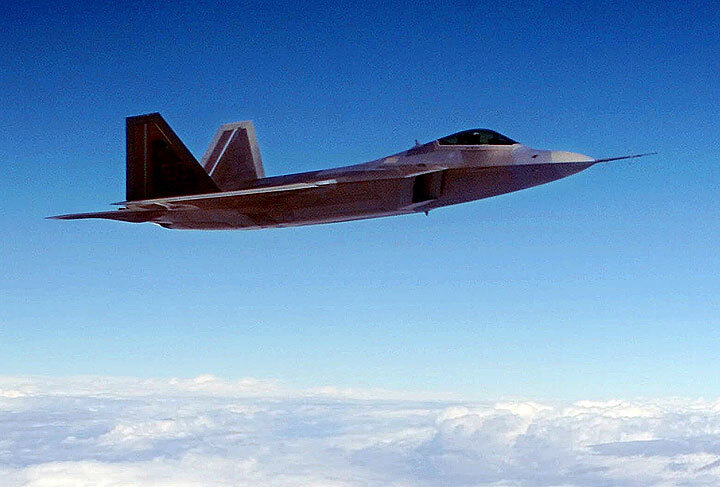 The Air Force has announced plans to base F-22 squadrons in Alaska and Hawaii, where they will replace F-15s, and in New Mexico, where they will replace F-117s.